As re-enactors we have also taken part in filming. Our work includes documentaries for the History channel and the National Geographic. The Harry Enfield show and the Italian production "Nel segno di maggio". Other work has included the big screen adaptation of Owen Sheers "Resistance" and the Indie film "Juden". 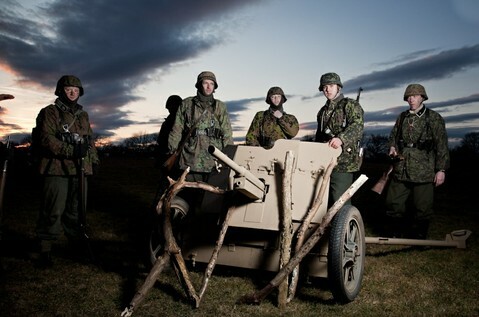 KSK are one of the premier groups in the UK re-enactment scene. We portray elements of the Leibstandarte Division of the Waffen SS. Other elements include a Feldgendarmerie (Field police), Sanni (Medical) unit, Kriegsberichter (War correspondent) and a Stabs (Command) section. We also have access to authentic vehicles of the period 1939 - 1945 which include motorcycle combinations, a replica Panzer III and during the 2014 War & Peace Revival show we worked in partnership with the event organisers to have an original Panzer IV as part of our display. We believe in being as accurate as we can in order to teach the public as to how the "Landser" lived during world war 2 whilst maintaining an element of fun and Kameraderie. Additionally we often raise funds for causes such as Help for heroes and the British legion.